(Newser) – What goes best with swanky beer? Swanky potato chips, apparently. 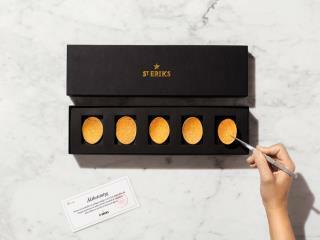 For a measly $11.20 per chip, snackers can enjoy what Sweden's St. Eriks Brewery describes as "the world's most exclusive potato chips." Brewmasters were apparently unhappy with ordinary snacks alongside St. Eriks India Pale Ale and decided to enlist the Swedish National Culinary Team to create "a snack of the same status" as its "first-class beer," a brand manager tells Adweek. The result is 100 boxes containing just five potato chips each, made by hand using "some of the most exclusive ingredients available in the Nordics." The price: $56 per box. I'll take PRINGLES! A snack staple for four decades, Pringles are now sold in over 140 countries, and the brand shows no sign of stopping! Also.. It's a lot cheaper! There ya go ALL!